PHOENIX - The U.S. government said Thursday that the man who called himself the toughest sheriff in America ran an office that has committed wide-ranging civil rights violations against Latinos, including a pattern of racial profiling and heavy-handed immigration patrols based on racially charged complaints. Arpaio struck a defiant tone in response to the report, calling it a politically motivated attack by the Obama administration that will make Arizona unsafe by keeping illegal immigrants on the street. "Don't come here and use me as the whipping boy for a national and international problem," he said at a news conference. The Justice Department's expert on measuring racial profiling said it is the most egregious case of profiling in the nation that he has seen or reviewed in professional literature, said Thomas Perez, who heads the Justice Department's civil rights division. "We found discriminatory policing that was deeply rooted in the culture of the department, a culture that breeds a systematic disregard for basic constitutional protections," Perez said. The findings will force Arpaio's department to make major changes to carry out new policies against discrimination and improve training of staff and officers. Arpaio faces a Jan. 4 deadline for saying whether he wants to work out an agreement to make the changes. If not, the federal government will sue him, possibly putting in jeopardy millions of dollars in federal funding for Maricopa County. The fallout from the report was swift. The U.S. Department of Homeland Security announced it is severing its ties with Arpaio, stripping his jail officers of their federal power to check whether inmates in county jails are in the county illegally, a move that was meant to speed up deportation. Homeland security officials also are restricting Arpaio's office from using a program that uses fingerprints collected in local jails to identify illegal immigrants. The scathing report on Arpaio, obtained by The Associated Press ahead of its release, marks the federal government's harshest rebuke of a man who rose to national prominence for his immigration crackdowns. Republican presidential candidates have competed for his endorsement. 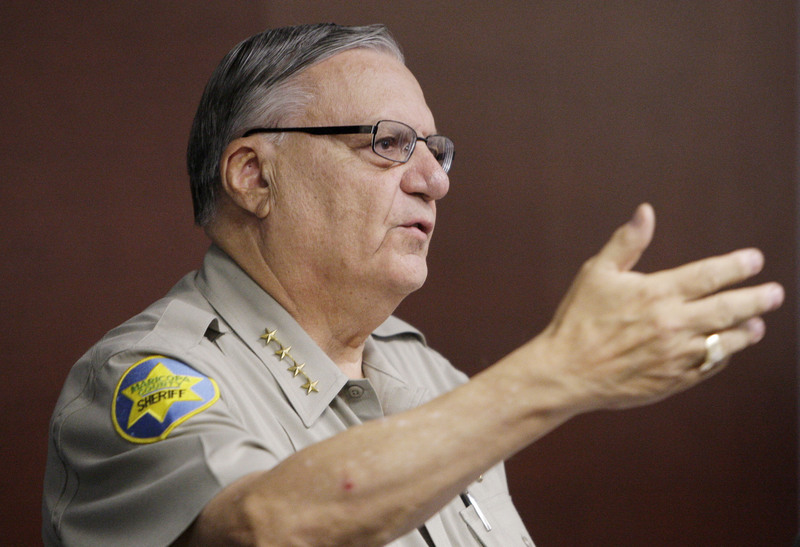 Arpaio has long denied the racial profiling allegation. His office did not immediately respond Thursday to requests for comment. Apart from the civil rights investigation, a federal grand jury has been investigating Arpaio's office on criminal abuse-of-power allegations since at least December 2009. The civil rights report criticized the sheriff's office for launching immigration patrols, known as "sweeps," based on complaints that Latinos were merely gathering near a business without committing crimes. The report said Latinos are four to nine times more likely to be stopped in traffic stops in Maricopa County than non-Latinos. Deputies on the immigrant-smuggling squad stop and arrest Latino drivers without good cause, the investigation found. A review found that 20 percent of traffic reports handled by Arpaio's immigrant-smuggling squad from March 2006 to March 2009 were stops -- almost all involving Latino drivers -- that were done without reasonable suspicion. The stops rarely led to smuggling arrests. Latinos who were in the U.S. legally were arrested or detained without cause during the sweeps, according to the report. Illegal immigrants accounted for 57 percent of the 1,500 people arrested in the 20 sweeps conducted since January 2008, according to figures provided by Arpaio's office. The civil rights report also found that police supervisors often used county accounts to send emails that demeaned Latinos to colleagues. One email had a photo of a mock driver's license for a fictional state called "Mexifornia." Federal investigators also focused heavily on the language barriers in Arpaio's jails. Latino inmates with limited English skills were punished for failing to understand commands in English by being put in solitary confinement for up to 23 hours a day. Detention officers refused to accept forms requesting basic daily services and reporting mistreatment when the documents were completed in Spanish, and they pressured Latinos with limited English skills to sign forms that implicated their legal rights without language assistance.